An appellate court ruling in the landmark Vergara v. California case moved closer to an end date today with the attorneys for the nine student plaintiffs filing their appeal brief. The brief is a response to the appeal arguments made by the defendants in the case, the State of California and its two largest teacher unions, the California Federation of Teachers and the California Teachers Association. The defendants lost the case last June when Los Angeles County Superior Court Judge Rolf Treu struck down California’s laws regarding teacher tenure, layoffs and dismissals by saying they deny students access to a quality public education. Treu stayed his ruling and left it up to state lawmakers to fix the problems he cited, making the outcome of the appeal a potential tectonic shift in education should the ruling stand. The defendants now have 20 days to file additional reply briefs, unless they are granted an extension. Once the briefs are all filed, the court will schedule a date for oral arguments, but there is no timeframe on when the court must schedule it, Theodore J. Boutrous, Jr., the plaintiffs’ lead co-counsel, explained in a phone call today with reporters. 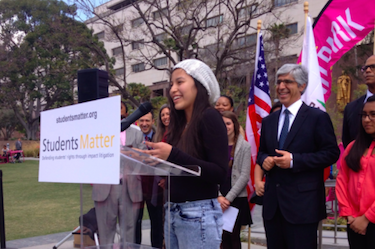 The plaintiffs in the case have been financially supported by the organization Students Matter. Once the oral arguments happen, the appellate court will then have 90 days to issue a ruling. “Realistically, we are looking at six months to a year [before the appellate court rules,]” Boutrous said. The defendants argued in their appeal that court did not apply proper legal standards in the case, that the plaintiffs used improper legal theories in arguing it, and that Gov. Jerry Brown should not be named as a defendant because he lacks “institutional interest” in the case, among other arguments. Boutrous expressed confidence in the plaintiffs’ appeal brief. “The briefs on the other side took issue with our legal theories, but, as we lay out, the legal underpinnings of our claims are well established, and they are based on the same principals that led to historic civil rights victories,” Boutrous said.